MacDILL AIR FORCE BASE, Fla. — The Obama administration plans to bolster the American military presence in the Persian Gulf after it withdraws the remaining troops from Iraq this year, according to officials and diplomats. That repositioning could include new combat forces in Kuwait able to respond to a collapse of security in Iraq or a military confrontation with Iran. The plans, under discussion for months, gained new urgency after President Obama’s announcement this month that the last American soldiers would be brought home from Iraq by the end of December. Ending the eight-year war was a central pledge of his presidential campaign, but American military officers and diplomats, as well as officials of several countries in the region, worry that the withdrawal could leave instability or worse in its wake. After unsuccessfully pressing both the Obama administration and the Iraqi government to permit as many as 20,000 American troops to remain in Iraq beyond 2011, the Pentagon is now drawing up an alternative. In addition to negotiations over maintaining a ground combat presence in Kuwait, the United States is considering sending more naval warships through international waters in the region. With an eye on the threat of a belligerent Iran, the administration is also seeking to expand military ties with the six nations in the Gulf Cooperation Council — Saudi Arabia, Kuwait, Bahrain, Qatar, the United Arab Emirates and Oman. While the United States has close bilateral military relationships with each, the administration and the military are trying to foster a new “security architecture” for the Persian Gulf that would integrate air and naval patrols and missile defense. The size of the standby American combat force to be based in Kuwait remains the subject of negotiations, with an answer expected in coming days. Officers at the Central Command headquarters here declined to discuss specifics of the proposals, but it was clear that successful deployment plans from past decades could be incorporated into plans for a post-Iraq footprint in the region. 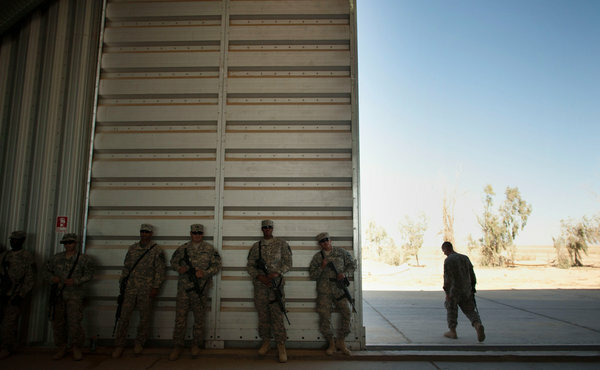 For example, in the time between the Persian Gulf war in 1991 and the invasion of Iraq in 2003, the United States Army kept at least a combat battalion — and sometimes a full combat brigade — in Kuwait year-round, along with an enormous arsenal ready to be unpacked should even more troops have been called to the region. Mr. Obama and his senior national security advisers have sought to reassure allies and answer critics, including many Republicans, that the United States will not abandon its commitments in the Persian Gulf even as it winds down the war in Iraq and looks ahead to doing the same in Afghanistan by the end of 2014. “We will have a robust continuing presence throughout the region, which is proof of our ongoing commitment to Iraq and to the future of that region, which holds such promise and should be freed from outside interference to continue on a pathway to democracy,” Secretary of State Hillary Rodham Clinton said in Tajikistan after the president’s announcement. During town-hall-style meetings with military personnel in Asia last week, the secretary of defense, Leon E. Panetta, noted that the United States had 40,000 troops in the region, including 23,000 in Kuwait, though the bulk of those serve as logistical support for the forces in Iraq. As they undertake this effort, the Pentagon and its Central Command, which oversees operations in the region, have begun a significant rearrangement of American forces, acutely aware of the political and budgetary constraints facing the United States, including at least $450 billion of cuts in military spending over the next decade as part of the agreement to reduce the budget deficit. Prof Curry said, the project’s research data show there has been no increase in world temperatures since the end of the Nineties – a fact confirmed by a new analysis that The Mail on Sunday has obtained. It was hailed as the scientific study that ended the global warming debate once and for all – the research that, in the words of its director, ‘proved you should not be a sceptic, at least not any longer’. Professor Richard Muller, of Berkeley University in California, and his colleagues from the Berkeley Earth Surface Temperatures project team (BEST) claimed to have shown that the planet has warmed by almost a degree centigrade since 1950 and is warming continually. Published last week ahead of a major United Nations climate summit in Durban, South Africa, next month, their work was cited around the world as irrefutable evidence that only the most stringent measures to reduce carbon dioxide emissions can save civilisation as we know it. It was cited uncritically by, among others, reporters and commentators from the BBC, The Independent, The Guardian, The Economist and numerous media outlets in America. The Washington Post said the BEST study had ‘settled the climate change debate’ and showed that anyone who remained a sceptic was committing a ‘cynical fraud’. But today The Mail on Sunday can reveal that a leading member of Prof Muller’s team has accused him of trying to mislead the public by hiding the fact that BEST’s research shows global warming has stopped. Prof Judith Curry, who chairs the Department of Earth and Atmospheric Sciences at America’s prestigious Georgia Institute of Technology, said that Prof Muller’s claim that he has proven global warming sceptics wrong was also a ‘huge mistake’, with no scientific basis. Prof Curry is a distinguished climate researcher with more than 30 years experience and the second named co-author of the BEST project’s four research papers. Her comments, in an exclusive interview with The Mail on Sunday, seem certain to ignite a furious academic row. She said this affair had to be compared to the notorious ‘Climategate’ scandal two years ago. Like the scientists exposed then by leaked emails from East Anglia University’s Climatic Research Unit, her colleagues from the BEST project seem to be trying to ‘hide the decline’ in rates of global warming. 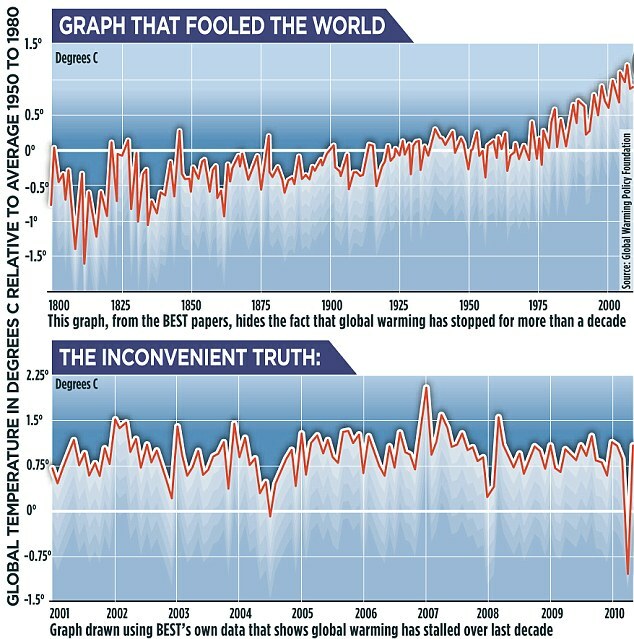 In fact, Prof Curry said, the project’s research data show there has been no increase in world temperatures since the end of the Nineties – a fact confirmed by a new analysis that The Mail on Sunday has obtained. However, Prof Muller denied warming was at a standstill. ‘We see no evidence of it [global warming] having slowed down,’ he told BBC Radio 4’s Today programme. There was, he added, ‘no levelling off’. A graph issued by the BEST project also suggests a continuing steep increase. But a report to be published today by the Global Warming Policy Foundation includes a graph of world average temperatures over the past ten years, drawn from the BEST project’s data and revealed on its website. This graph shows that the trend of the last decade is absolutely flat, with no increase at all – though the levels of carbon dioxide in the atmosphere have carried on rising relentlessly. Prof Muller also wrote an article for the Wall Street Journal. It was here, under the headline ‘The case against global warming scepticism’, that he proclaimed ‘there were good reasons for doubt until now’. This, too, went around the world, with The Economist, among many others, stating there was now ‘little room for doubt’. Such claims left Prof Curry horrified. In fact, she added, in the wake of the unexpected global warming standstill, many climate scientists who had previously rejected sceptics’ arguments were now taking them much more seriously. They were finally addressing questions such as the influence of clouds, natural temperature cycles and solar radiation – as they should have done, she said, a long time ago. Yesterday Prof Muller insisted that neither his claims that there has not been a standstill, nor the graph, were misleading because the project had made its raw data available on its website, enabling others to draw their own graphs. However, he admitted it was true that the BEST data suggested that world temperatures have not risen for about 13 years. But in his view, this might not be ‘statistically significant’, although, he added, it was equally possible that it was – a statement which left other scientists mystified. ‘I am baffled as to what he’s trying to do,’ Prof Curry said. Prof Ross McKittrick, a climate statistics expert from Guelph University in Ontario, added: ‘You don’t look for statistically significant evidence of a standstill. The BEST project, which has been lavishly funded, brings together experts from different fields from top American universities. It was set up 18 months ago in an effort to devise a new and more accurate way of computing changes in world temperatures by using readings from some 39,000 weather stations on land, instead of adding sea temperatures as well. Some scientists, Prof Muller included, believe that this should provide a more accurate indication of how the world is responding to carbon dioxide. The oceans, they argue, warm more slowly and this is why earlier global measurements which also cover the sea – such as those from the Climatic Research Unit at East Anglia University – have found no evidence of warming since the Nineties. The usual way a high-profile project such as BEST would publish its results would be in a scientific journal, following a rigorous ‘peer review’ by other experts in the field. The more eminent journals that publish climate research, such as Nature And Science, insist there must be no leaks to the media until this review is complete and if such leaks occur, they will automatically reject the research. Earlier this year, the project completed four research papers. As well as trends in world temperatures, they looked at the extent to which temperature readings can be distorted by urban ‘heat islands’ and the influence of long-term temperature cycles in the oceans. The papers were submitted to the Journal of Geophysical Research. But although Prof Curry is the second named author of all four papers, Prof Muller failed to consult her before deciding to put them on the internet earlier this month, when the peer review process had barely started, and to issue a detailed press release at the same time. He also briefed selected journalists individually. ‘It is not how I would have played it,’ Prof Curry said. ‘I was informed only when I got a group email. I think they have made errors and I distance myself from what they did. ‘It would have been smart to consult me.’ She said it was unfortunate that although the Journal of Geophysical Research had allowed Prof Muller to issue the papers, the reviewers were, under the journal’s policy, forbidden from public comment. Prof McKittrick added: ‘The fact is that many of the people who are in a position to provide informed criticism of this work are currently bound by confidentiality agreements. In Prof Curry’s view, two of the papers were not ready to be published, in part because they did not properly address the arguments of climate sceptics. As for the graph disseminated to the media, she said: ‘This is “hide the decline” stuff. Our data show the pause, just as the other sets of data do. Muller is hiding the decline. Prof Muller defended his behaviour yesterday, saying that all he was doing was ‘returning to traditional peer review’, issuing draft papers to give the whole ‘climate community’ a chance to comment. He said his decision to publish was completely unrelated to the forthcoming United Nations climate conference. This, he said, was ‘irrelevant’, insisting that nothing could have been further from his mind than trying to influence it. What is Devilish About Freemasonry?